Moon cake prices have gone up to a ridiculous high. To compete, suppliers have come up with all sort of different flavours to entice consumers. Though innovation is good but when it becomes too much, it lost that traditional values. I remembered when we were young, those plain cookie like moon cakes were a hot favourite among the kids. Especially my two sisters whom I think still enjoy such cookies. When I saw a gardening friend made piglet moon cakes, I asked for her recipe and she gladly shared with me. I didn't know it was so much harder to make than baked moon cakes! The ingredients were simple but the process was really long. In fact, it took me nearly the whole day but it was all worth it. Unfortunately by then my mood was already dampened by son. He came home moody and totally ignored us and then he started shouting at me. Only then I found out that his phone was confiscated by the school and he blamed me for saying yes to a month suspension. We took the chance to reaffirm all those empty promises he made to us when he requested for a new phone on his birthday. This time round, I seriously need him to honour those promises! These days’ teens are so darn difficult to handle. They don't know what respect is. When they couldn't get their way, it was hell for everyone. Even his teacher wrote and tells me that he was so angry with him that he needed to walk away! The teacher has to walk away! This boy is forever challenging authority; I wonder what will become of him when he reached adulthood. I fear. I took the opportunity to teach my girl. I told her never chose a boy that is rude to his parents because he will not know how to respect you. She turned around and said "mommy, in 20 years time, if I bring home a boy and you interview him okay?" I just couldn't stop laughing. I told her "I shouldn't be the one interviewing him; you have to do it yourself". Now back to my piglet moon cakes, I done a really bad job in moulding them. They looked sad! Then I think I didn't wait for that 1 - 2 mins before glazing so it could be this reason my piglets cracked. I also didn't have thick dark soya sauce and thus resulted in a light toned piglets. More room for improvement! Another excuse to try again! Latest Update: My friend is not comfortable in sharing the recipe due to copyright issues but I found close similar recipe on the internet. Blend golden syrup, oil, alkaline water and bicarbonate of soda with 1 tsp of flour. Use a spoon to stir until well mixed. Leave aside for several hours. Sift the remaining flour into a mixing bowl and make a well in the centre. Add in the combined syrup mixture. Knead into a soft dough. Leave aside covered for 30 minutes. Bake for 180 degrees for 8 mins. Remove and cool for 1 - 2 mins before glazing with a beaten egg. Bake for another 6-7 mins or till golden brown. Edith, is true that mooncake price actually raised up a lot compared to last year! and there are so many new flavors coming out but I still prefer traditional type lol. I totally agree with you on the teens now a day. Dun talk about teens, kids like my daughter only 8 years old, when cant get what she want, she will make the remark "you are so bad!". Pissed me off that I told her if I am bad then dun call me mummy any more lol. Luckily she is still very well behaved in school but she will definitely more challenging to handle when she is a teen, feeling headache now. Zoe, these days kids are totally different from my era. Pretty scary. Time passes very quickly that before you know it, your kids will be all grown up. Sometimes as teenagers and when at home, they may give problems ...but later, they may change for the better. I think as long as they know that restrictions are set for their own good, one day, they will understand. They will know that your love for them is unconditional and whatever you do is for their good. I think I need to consume more ginseng. Those moon pies are so cute!!!! 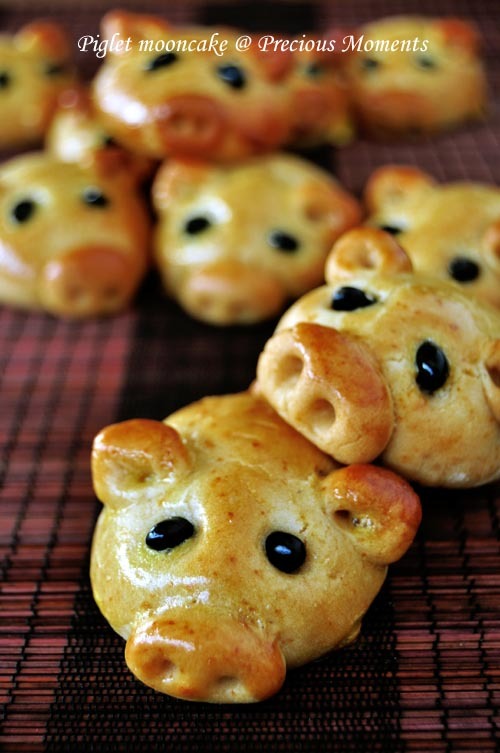 I never made moon pies before, but when I do I will try the piglet version.